“Are you sure this is the right way?” I panted, extricating a thorny branch from where it was aggressively tangled in my hair. We were waterfall hunting, and found ourselves halfway up a steep embankment, not a whisper of path in sight, covered in scratches from hacking our way through the jungle. I grumbled and griped and sweated my way uphill… and indeed, we got there eventually - not another soul in sight. Gallons of water pounded away at the riverbed below, and we stood above it all, watching it tumble. If there is any better feeling than having walked an hour and a half through the tropical heat of unexplored jungle to emerge at the top of the waterfall, I don’t know of it. At my insistence, we walked back home along the river, at ground level - no climbing necessary. It is experiences like this which characterize El Salvador as a whole: sites of incredible natural beauty, or postcard-perfect mountain villages, with barely another tourist around. And those tourists we did see were generally locals, taking a break away from San Salvador, the capital. The exploration of colonial towns and villages is generally high on the priority list of any visitor to Central America. Antigua in Guatemala and Granada in Nicaragua are swarmed with foreigners, aggravating taxi drivers as they walk blithely into the street to get that perfect picture, or meekly trooping along at the behest of a world-weary tour guide. There’s a huge market for enterprising locals, in selling hammocks and ceramics designed to hit that perfect Westerner sweet spot: colorful patterns and cheap prices; some semblance of authenticity, but ultimately with limited concern for whether or not it was indeed handmade locally. The prices of food and activities inflate to match the tourist numbers, and you can find an iced latte around every corner. But El Salvador is different. Head along the tourist trail of the Ruta de las Flores - the coffee-growing region - and you’ll find yourself sharing cafes with sun-leathered men playing cards and smoking cigarettes, rather than bloggers intent on instagramming their flat white. You won’t get hounded by touts selling tours and tat, because there really aren’t any. The cobbled streets aren’t yet thronged with people, apart from during rush hour, when school children battle past each other with their backpacks. And walks to waterfalls are a hidden adventure, not a tourist money-spinner. After spending an initial couple of days on the surf beaches of El Tunco, the one well-trodden spot in the nation, then a further two in the capital, we boarded a series of buses and wended our way up to the mountains. Sideward glances were shared among our fellow passengers as we made our haphazard way onboard, oversized bags squeezing through the thronged aisles. We got comfortable, sitting three abreast on battered bus seats, headed for the colonial villages we’d never heard of. Our first stop was Juayua, home to the seven waterfalls of Los Chorros and a lively weekend market, where we munched our way through plates of pupusas - flattened fried circles of dough filled with garlic, cheese and meat - and chatted in bad Spanish to the stall holders. After a night spent dodging monsoon showers and exploring deserted streets, we retired to the guesthouse that we shared with an extended El Salvadoran family, whom we nodded to on our way past as they ate their dinner. 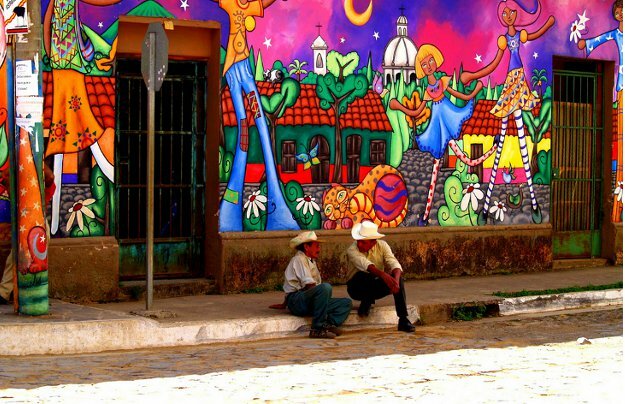 Next was Ataco: quiet, cobblestoned, colorful murals adorning the houses on all sides. We hiked up to the mirador to see the village spread out like patchwork, red roofs contrasting sharply with white bricks. For the afternoon we hopped on a bus to the hot springs at Santa Teresa, near Ahuachapan, to soak in warm sulphuric pools, and bask on sun loungers - a luxury spa experience for a mere $10. Then it was a quick two days in Suchitoto, the sleepiest village of the bunch. So sleepy that the road to the waterfall - the main attraction - wasn’t even signposted. Our only instruction was a cheerful man on his way to the shops, who waved us on our way, tipping his 10-gallon hat like a lazy motif in a bad Western movie. Getting lost was inevitable; finding our way back wasn’t. At the end of two days in Suchitoto, it felt like we were no longer visitors, but cherished members of the village family. We drank beers, sat out in the street, and watched football with the old man whose B&B we were staying in. On arrival, he took our payment for the room and shoved it carelessly under a book in the living room. It was so familiar, so comfortable, that I didn’t want to move on to the next place. In fact, I felt that way with every place we stayed in along the way. 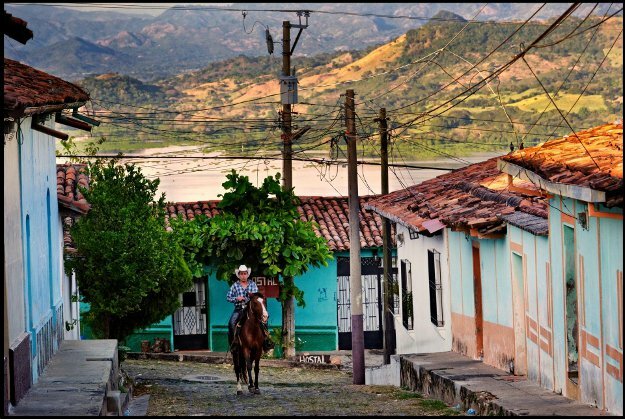 El Salvador’s colonial villages actually do feel like they’re frozen in time; like they settled into a particular era and can’t yet be reached by crowded tour buses and commercialism. You wander round and marvel that more people don’t know about these places, but at the same time, you’re glad that they don’t -- it’s a secret that you don’t want to share. If the crowds ever do descend, they’ll lose some of the charm. They’ll lose the double-takes you create when you walk by, lose the authentic meals for $1, and the genuine curiosity of the people you meet to hear your story and learn about what you’re doing there. 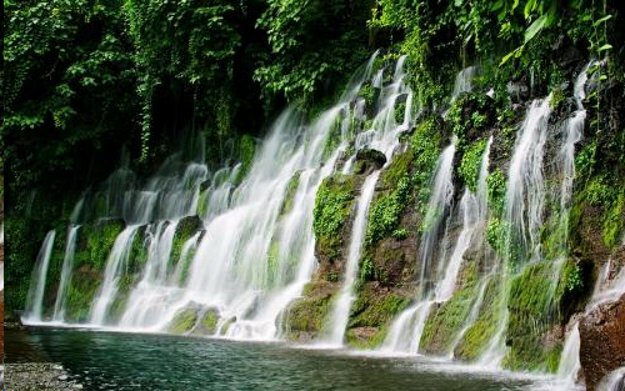 Above all, though, the marvelous thing about El Salvador is the ability to find your own path. There just isn’t really a tourist trail; there’s no logical route through the country, just as there are no signposts to its biggest attractions. It’s not easy to travel without a roadmap, nor is it always relaxing to travel through a country with violence and unrest historically at its core. But when you stand at the top of a waterfall that nobody else has laid eyes on in weeks, you realize that the effort of the journey was worth it for the rewards you find at the end. Ellie Hattersley is a contributing writer at Highbrow Magazine.